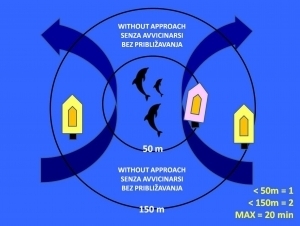 The code of conduct and recommendations in the vicinity of the dolphins and other marine mammals that you see on the Vivamar web site are aligned with the guidelines for the observation of whales and dolphins from the ACCOBAMS (Agreement on the Conservation of Cetaceans in the Black Sea, Mediterranean Sea and contiguous Atlantic area). They are summarized by the Ministry of the Environment and Spatial Planning (MESP) on its website. Dolphins living in the Adriatic are protected animals that have the status of the threatened species for the entire Adriatic Sea, according to the IUCN (International Union for Conservation of Nature) Red list of threatened species. Any disturbance or even injury of the animals is prohibited and punishable. Vessels in the immediate proximity of the dolphins might disturb them and prevent their free movement. Boats can potentially scare them, confuse them, reduce their ability to orient, to forage and obtain enough energy for the daily expenditure. If the boats are not navigating like recommended they can break up their established group, dolphins normally change their behavior into the erratic and unexpected movements and direction, extend the dive time, and cause displacement to another place. 50 meters away from the animals. Within this distance, there may be maximum one boat, and within 150 meters there can be two additional boats. NEVER make quick changes in your navigation direction or the speed. In case dolphins approach you, do not perform sudden maneuvers. Adjust the direction of your navigating in parallel to their movement. Do not follow the dolphins or do not turn the boat directly into their group do not chase them. If one of the dolphins comes close to the bow, the vessel MAY NOT suddenly change the direction or even the speed. Do not navigate so that you’d encourage the dolphins to swimm at the bow. The longest presence of the vessel in dolphins’ presence is 20 minutes. Tail slap of the dolphins is usually a sign of the agitation. is more than 300 m away from the animals. Code of conduct sketch in the presence of dophins. Enjoy the enocunter with the dolphins, they are really adorable. And they keep our sea healthy. Their presence shows us in a way that our sea is still healthy. If we push them away from this area the whole sensible marine ecosystem of the shallow north-eastern Adriatic might be jeopardized. Along – how would you feel, if being a dolphin, and someone would constantly press into you, not leaving you to have a dinner for example? Even, if that other critter might be so much enthusiastic about you? You’d not feel well, would you? And the dolphins are the same. Let’s admire them together for the years to come!